For seven breathtaking days, explore majestic South Georgia—including Shackleton’s Grytviken gravesite—from its snow-covered plateaus and 15-foot icicles to its huge colonies of king penguins and nesting black-browed albatross. • Spend seven days exploring South Georgia, a land of majestic beauty and amazing wildlife. 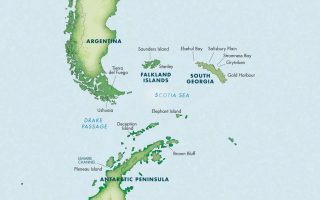 • Visit the beautiful, windswept Falkland Islands to view nesting black-browed albatross, Magellanic and rockhopper penguins, along with a host of endemic birds found nowhere else in the world. • Witness huge colonies of king penguins; with over 200,000 at Salisbury Plain, the colony extends for miles along the sandy beach and tussock-covered hillside. • Learn about early polar exploration and whaling history, including a visit to the burial site of Sir Ernest Shackleton. • Watch the antics of fur and elephant seals—males protecting harems, juveniles sparring, and females tending to adorable young pups. • All existing cabins will be furnished with all new soft furnishings and brand new bathrooms. • Main common areas such as the Lounge and Dining Room will be remodeled as well as the Bar. • Major technical enhancements – include two new Rolls Royce engines, which will significantly increase fuel efficiency and minimized carbon footprint. Upon arrival in Santiago transfer to our hotel. Enjoy brunch and spend the rest of the day relaxing or join an optional sightseeing excursion. Welcome dinner and overnight at our hotel. After breakfast board your flight to Stanley (extra charge), and enjoy free time to explore this charming British-flavored town. 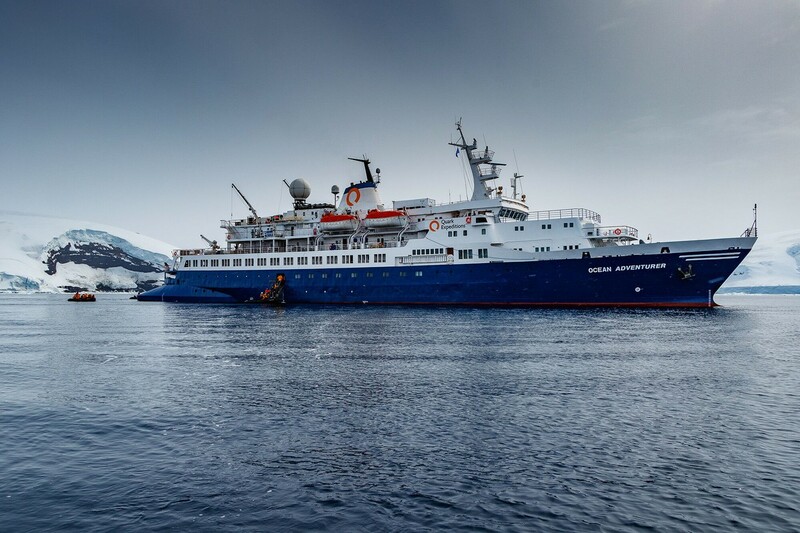 Embark the Ocean Adventurer this evening. Spend two days at sea, attending informative lectures on the history, geology, and amazing wildlife of this region. Join naturalists on deck to search for the marine mammals and seabirds that flourish in these nutrient-rich waters. Flexibility on this expedition is a must. The expeditionary nature of this voyage prevents us from publishing a day-by-day itinerary, but the following is a list of places we plan to visit. Some are pending final government approval.Elsehul Bay – This beautiful bay is home to thousands of fur seals. Listen for the high-pitched trumpeting of king penguins amid the magnificent sounds of marine mammals echoing throughout the bay.Right Whale Bay – Land on a volcanic black-sand beach in search of southern fur seals, elephant seals, king penguins, and the other bird species known to inhabit the area.Salisbury Plain – Two glaciers flank Salisbury Plain on South Georgia’s north coast. Here, more than 200,000 king penguins congregate and breed, and you are greeted by one of the more remarkable sights—and sounds—on Earth.Hercules Bay – At this rocky bay you have the opportunity to view macaroni penguins, the most numerous of all penguin species.Stromness Bay – Site of Shackleton’s arrival after crossing the island’s glaciers on foot, Stromness offers views of cliffs and a glacier, which the adventurer and his companions descended.Grytviken – Explore Grytviken on foot, discovering the ruins of this once-active whaling station. The cemetery holds a special fascination, as it is here that Shackleton is buried. Hiking along the beach you will see penguins and other seabirds, as well as marine mammals.Royal Bay – The 1882 German transit of Venus expedition conducted its research at this large bay, and remains of the party’s buildings still stand on shore. Ross Glacier forms a dramatic backdrop to the wild scenery, where 50,000 king penguins await.Gold Harbour – At the foot of the Bertrab Glacier, Gold Harbour is often referred to as the “jewel in the island’s crown.” In addition to a large king penguin colony, you are likely to see elephant and fur seals, gentoo penguins, giant petrels, and with luck, light-mantled albatross.Cooper Bay – This bay features spectacular rock headlands with sharp cleavages of metamorphosed sandstone, presenting intriguing geological perspectives. Here you are likely to encounter light-mantled albatross; king, gentoo, and macaroni penguins; prions, petrels, and terns; and fur, Weddell, and elephant seals.Peggotty Bluff – Visit Peggotty Bluff where Ernest Shackleton’s party established a camp in 1916. Our lecturers recap our experiences at South Georgia. 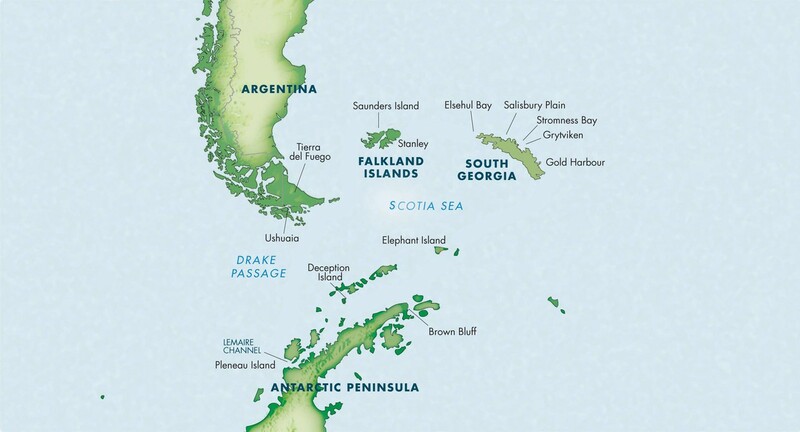 On Saunders Island you will find colonies of gentoo, rockhopper, and Magellanic penguins, as well as black-browed albatross. Today visit one of the largest albatross colonies in the world with thousands of black-browed albatross sitting atop their nests. Also ashore are rookeries of Gentoo penguins and South American sea lions. Lecturers recap your experiences as you cruise toward the southernmost city in the world. Disembark and transfer to the airport for your flight to Buenos Aires (extra charge), connecting with independent flights.